At Jason Collingwood’s Plain Weave Rug Workshop in Waco, Texas last week, I completed a technique sampler. I was not one of the fastest guns in the West, so I have a couple yards (or more…) of that linen warp still on my little loom. One piece of advice Jason gave in class was to use the intricacies of these techniques sparingly–to keep it simple when it comes to rug design. 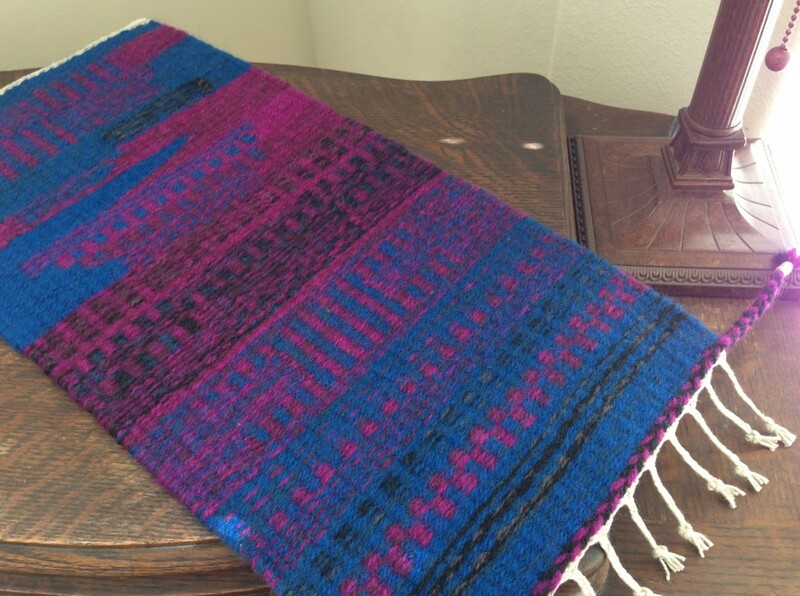 That is what I am aiming for as I finish off this warp, hoping to end up with some miniature rugs (the warp is only 11 1/4″ wide) as design samples. Finished sample of plain weave rug techniques. The sample begins with countered twining that extends past the selvedge with a four-strand braid. My favorite technique is the crossed weft combined with meet and separate, seen at the far end of the sample. Jason was kind enough to converse with me on topics that would benefit you, my blog friends. You can catch the first part of that conversation, covering Jason’s perspective as a rug weaver and a teacher of rug weaving, here. Now, enjoy Part 2 of our conversation. Me: Once someone has mastered the technical aspects, and is producing quality handwoven goods, they may want to sell what they have produced. What advice do you have for someone just starting out? Jason: You need to be very determined. You have to accept that it’s not going to happen instantly. And you have to be prepared to sacrifice certain things in life that a normal job may give you–be that security, spare income, or, possibly, medical insurance coverage. Me: It’s challenging to get started, then? Jason: I look back to my early years, and it’s interesting… And Akiko, my wife, is a very successful ceramicist now, but when she started off, to save money, she would walk across London four or five miles, with a little dolly on wheels. She would buy her bags of clay, put them on the dolly, and wheel them back across London. And you know, there are all these early little sacrifices that you don’t see, when you see the person in the galleries successfully selling their work. Me: Your father, Peter Collingwood, was well-known as an extraordinary rug weaver. But you still needed to put in a lot of hard work, yourself, for people to associate Jason Collingwood with high quality handwoven rugs. So, if someone aspires to succeed as a weaver, how can they make it work? Jason: I think you need to have determination, and some amount of grit, and self-discipline. At the end of the day, there’s no one telling you to sit at that loom, and weave again the same things you did yesterday, and again, and again, and again. I think it’s just perseverance. As long as you are producing something of quality, eventually, if you persevere, it’ll pay off. Me: Okay, that gives hope to someone willing to work hard. If we look beyond the present challenges, and work, with determination, we have something to look forward to. Jason: You know, those barren early years are almost like an investment in your future life, your weaving life. I mean, I didn’t particularly enjoy those years, but I think they were almost a necessary test of whether I was going to stick it out. I think a lot of people would’ve folded in those early years, and said, Okay, this isn’t working. But, you know, it was kind of a test of my resolve that I carried on. Me: Thank you for sharing your story! Your insights bring considerable value to weavers, but also to people in other fields interested in improving their craft. I appreciate the encouragement of your example of determination. Thanks again! Please visit Jason Collingwood’s website, here, to see the stunning rugs he weaves and sells, as well as descriptions of his workshops. You can also enjoy the artistry of Jason’s wife, Akiko, at her website, here. May your determination and perseverence pay off. Lovely Karen – it was fun to visit the workshop and see what everyone was doing – wish I could have joined in the fun! I’m glad you stepped in, Christina. It was good to see you. I hope we can be in another class together again sometime.